What does Google know about you when you browse the web? If you are an avid user of Google and use most of its services like Maps, Calendar, Gmail, ... then you probably know how much data about you is being processed on the Google servers all around the world. But what data does google actually have? How can you view that data, what is it being used for, and how to delete it. As the biggest search engine, and in my experience the most effective one, is Google Search. It was put online quite a while ago: 15 september 1997. Since that time it has caused Google to grow tremendously and enter a lot of different markets ( Cloud, automobile industry, mobile industry, ...). But since that search engine has been around for so long and is currently hosting around 70% of all search queries, it has collected a lot of data about how people search and what people are looking for. If you are constantly logged in with your account when searching on Google, after a few searches Google can start to figure out what you are looking for. For example: If you are looking up information about cities in India, you are probably going on a trip there. And that's where advertising comes into place, Google Adwords shows advertisements while you are searching. And the more relevant those advertisements are, the better for the advertiser. Going back to the example about the trip to India, Adwords will most likely start showing advertisements of major Airlines and how much that trip will cost / best rates. Another example that applied to me recently was when I was browsing the web, looking for a new barbeque. After a while the advertisements during search and on the websites (those handled by Adwords) started showing me barbecues, and most surprisingly the exact barbeque I had been looking at on different sites. Google search and adwords quickly figured out exactly what I wanted, and that on a daily basis means that they know a lot about my likes and dislikes by just looking at my search history. For those who don't know Google Analytics, it is a free tool for webmasters to analyse the traffic that comes to their website and see what people do on their site and how long they do certain things. On E-commerce sites also sales are completely tracked. Google Analytics is the best free tool around to get analytics data for your website and mobile applications. But why is such a great tool free? Quite simple, this allows Google to keep track of you while you are browsing the web, even when you leave the Google pages. More data, means more relevant adds. Let me go back to my example looking for a barbeque. If I had not used Google Search, and had directly gone to shopping sites I knew and looked there. I would still have gotten those adds in Google Search and on other websites. Why? Because most of those sites were using Google Adwords for their advertisements and Google Analytics to track me and what I did. This allows Google to create a shopping and website profile about me easily because the data is there. They can track me on almost any website. In Europe though, with the cookie walls, you are notified about the fact that this his happening. Google Chrome, around since 2008 is a web browser created by Google. It has convinced quite a large percentage of people to use their browser: 68%. Currently you can log in with your account directly into your browser so that you can easily sync settings and addons between different computers. But that off course is not all. Since you are logged in on your browser Google can track everything without having the need of you to use Google Search and websites using Google Analytics. When you use Chrome, Google can see every URL you visit and a lot more. You can view your browsing and search history on Google History. It gives you an overview of your search queries and the pages you have visited. The more Google tools you use, the more complete this data will be. Everything is on this single page and allows you to see what Google has about what you have done over a specific timeframe. 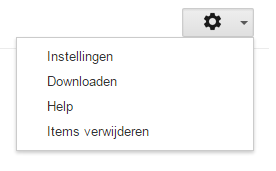 There is also the possibility to delete things and download it from the settings menu. I personally use all the things mentioned above. I constantly use Google Search for my queries when I am logged in. I use Google Analytics myself on my personal website and I browse the web using Google Chrome. As an eCommerce Consultant I know how important data about users is. It allows me and my clients to give the best experience on the website. To navigate them to what they want, and as fast as possible.